Rubens was all his life a devout practicing Catholic. As ambassador to the court of Philip IV, he was always in close contact with Spain. Unlike representations of Doctors and Fathers of the Church, the dove representing the Holy Spirit does not allude to any claim on Saint Teresa's part to divine inspiration. Her works although popular and respected were not regarded as on the same level as the Fathers and Doctors. "One day-it was the vigil of Pentecost-I went, after Mass, to a very solitary spot, where I used often to say my prayers, and began to read about this festival in the Carthusian's Life of Christ. While I was meditating in this way a strong impulse seized me without my realising why. I had to seek some physical support, for so completely did my natural strength fail me that I could not even remain seated. While in this condition, I saw a dove over my head, very different from those we see on earth, for it had not feathers like theirs but its wings were made of little shells which emitted a great brilliance. It was larger than a dove; I seemed to hear the rustling of its wings. It must have been fluttering like this for the space of an Ave Maria. But my soul was in such a state that, as it became lost to itself, it also lost sight of the dove." 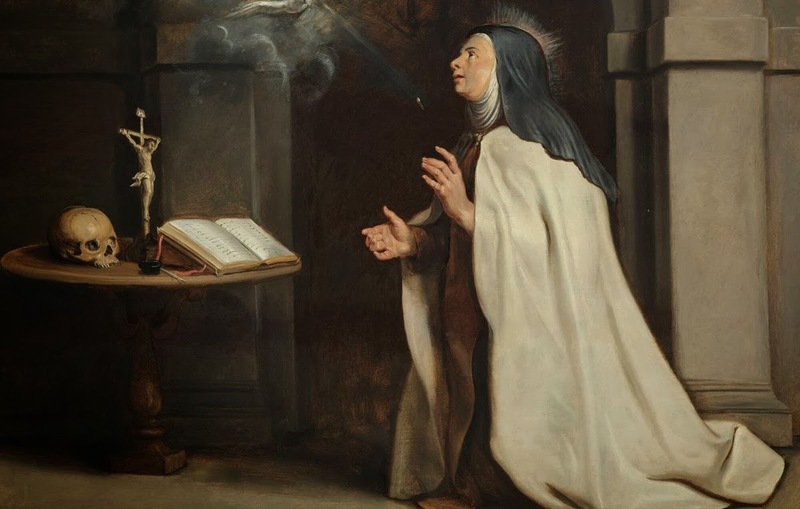 The English convert poet Richard Crashaw 1612–1649 had a great devotion to St Teresa. 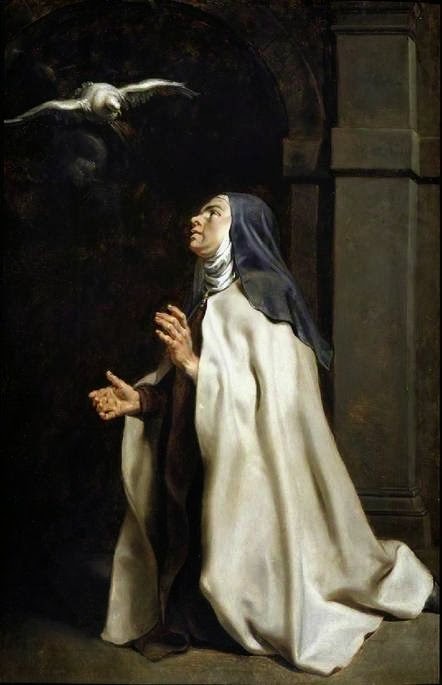 He composed three poems in honour of her: "A Hymn to Sainte Teresa," "An Apologie for the fore-going Hymne," and "The Flaming Heart"
"O thou undaunted daughter of desires! Unto all life of mine may die." "he offered more prayers in the night, then others usually offer in the day; There, he penned these Poems, Stepps for happy soules to climb heaven by." And that is why T.S. Eliot rated Crashaw’s overall poetic performance above the two esteemed romantics, Keats and Shelley.